Well somehow January came and went before I was ready for February. We have had a very snowy winter this year and I think my focus was on that instead of days of the month. I even scheduled a Saturday to help teach two friends to knit...but I had the wrong weekend in my head. Sigh. The knitters get together did happen and the ladies are progressing nicely. But now it's time for ME. I want to start planning my next sweater. I want to use Mountain Colors 4/8's Wool. I still haven't picked a color and I still haven't decided for sure on a pattern but I decided today that I really needed to do a good gauge swatch. You ALL knit swatches don't you!!?? For what ever reason I knit very loosely. I almost always have to go down at least one or two needle sizes when following a published pattern. No big deal once I am knitting BUT how do I know what size needle to use to make sure I get the CORRECT gauge? You guessed it...I knit a swatch. At some point in the past I learned a handy way to keep track of what needles I have used to knit a given swatch. So I thought I would share this tip with all of you. 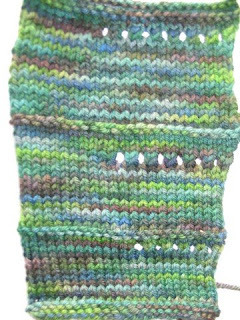 As you can see in the photo I put holes in each section of this swatch. When I use size 5 needles I make 5 holes; size 6 needles I do 6 holes, etc. To make these holes I just do a YO (yarnover), K2tog for each hole. I find this method very handy and much easier than finding a tag somewhere in the house and attaching that with string. One of the gals who works for Mountain Colors is a very tight knitter. For her to get a gauge of 4.75 sts/in she would have to use a size 8 needle. Everyone is different and everyone knits a slightly different way....that's why the swatching is critical to the success of your project. I recently ripped out a sweater that was going to be 8" too big because my gauge was completely different in garter st than it was in the stitch pattern I was using. So if you plan on using a stitch pattern be sure to check that gauge too!! I'm off to start browsing the patterns. I might try something with cables as I really want to improve that area of my knitting skills. What do you have planned? Be sure to do that swatch!! !